Management 11 Edition Readers discover the confidence to manage and develop the ability to lead with innovative solutions in today's rapidly changing business environment with Daft's marketing-leading MANAGEMENT, 11E. 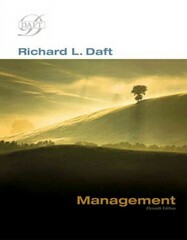 Daft explores the emerging themes and management issues most important for managers in businesses today. Future and current managers learn to look beyond traditional techniques and ideas to tap into a full breadth of management skills. With the best in proven management and new competencies that harness creativity, Daft defines Management. Available with InfoTrac Student Collections gocengage.com/infotrac.